As I loped across Ashen’s bleak landscape, a figure came charging out of the mist. I stopped short and readied my club. Unlike the thugs I’d bludgeoned some yards back near a campfire, this NPC approached at a steady clip and weaved drunkenly over terrain. As he came closer, I saw that he was indeed a he—humanoid, outfitted in plain garb similar to mine, and clutching a spear. Suddenly he turned and saw me. His zigzagging ceased and he came at me directly. I clicked R3 on my Xbox One controller to lock on. Nothing happened. Out of options and not just a stone’s throw away from my would-be opponent, I mashed R1 to unload a series of light attacks. My club passed through my assailant’s form as if he were made of the same mist from which he’d materialized. The stranger stopped right in front of me, jumped straight up as if I were a drill sergeant barking commands, then ran threaded around me and ran on his way, toward a rock wall with two handhelds that stumped me earlier. As I watched his form grow smaller, realization dawned. That was no enemy, nor was he an assailant. I had been the aggressor, and in so doing, scared off a potential ally. From the stamina bar positioned underneath your HP bar and familiar button mappings such as light and heavy attacks on the R1 and R2 triggers, respectively, to its emphasis on nonverbal communication, Ashen’s influence is clear. My demo, which took place at Microsoft’s E3 showcase, began with me controlling a premade avatar and a few weapons. Armaments must be scavenged from corpses and caches planted throughout Ashen’s world. As I rotated the camera to get a better look at my avatar, I observed one unnerving contrast between Aurora 44’s game and Souls. In Dark Souls and most RPGs, players spend hours customizing their appearance with all sorts of sliders and meters that change minutia such as eye position. 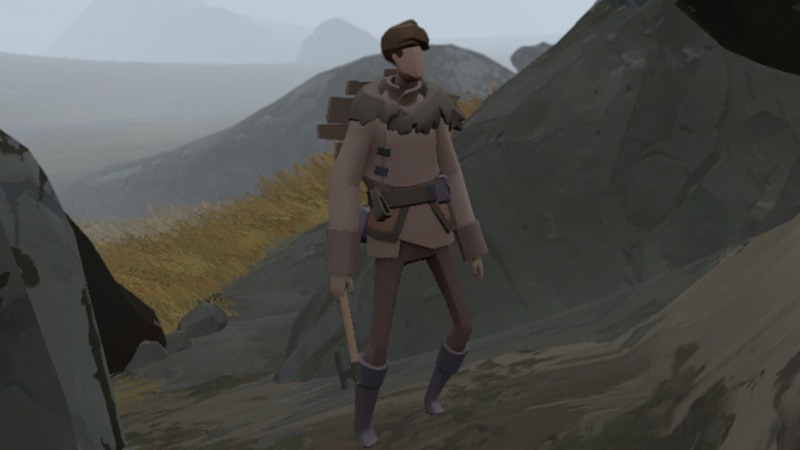 Characters in Ashen have smooth, blank visages, like the wooden mannequins that artists pose to strive for lifelike drawings. I tracked the mystery player to the wall I’d come to earlier, a sheer face with two sets of holes designed to fit two pairs of hands. Running in circles to get my prospective partner’s attention—Ashen had no way to emote or gesture that I could find—the other player got the hint. Each of us faced the wall and gripped our handhelds. Working in sync did the trick. The stone parted, revealing an opening leading down into darkness. Once inside, we stuck together—at first. My ally and I flanked spiders that crawled up from holes in the rock, one of us playing decoy while the other beat its head to a pulp. We ventured through the cave until we reached a gaping hole. Creeping up close, I observed that the drop was deep. I took a step closer, then stepped away, and went still. My partner eased up to the edge, then had a change of heart and ran off down a murky corridor. I felt a momentary pang of the sort Dark Souls players experience when a summoned companion, especially one who fought side by side against a level’s denizens and boss, fades away, likely never to be seen or heard from again. Undaunted by my abrupt solitude and with only a smidgeon of health remaining, I took the plunge. Below, my character took a moment to rise to his feet. I squinted through shadows and found myself in a cave. A moment later, a life meter formed at the bottom of the screen. That, too, should be familiar to Dark Souls fans: A boss had entered the area. Sure enough, a dark form crawled out of the earth and sprinted at me. I fled, gobbling a mushroom to replenish health and trying to get my bearings. Every time the boss got close, my screen would flicker, growing dark. As if its proximity smothered the feeble light cast by my lantern. Alone and out of healing items, I fell quickly. Despite my defeat, I came away from Ashen energized. The game was announced at E3 2014, three years that Aurora 44 has spent toiling at its Dark-Souls-meets-Journey mashup. Although the game isn’t due to hit Windows 10 and Xbox One until early 2018, the end result appears to be what Souls fans are constantly on the lookout for: A Souls-like with clear connections to FromSoftware’s masterpiece that puts a creative twist on a time-tested formula. This preview was based on a pre-release demo of the game at an event where refreshments were provided by Microsoft. Ashen looks epic, I need this game! Is this from the same developer as Massive Chalice? Something about the art direction and music gives me a Massive Chalice vibe.